Travelling the middle-eastern terrains of Iran and Turkey, the Persian scholar par excellence, Salma Hussain has been a consultant to ITC hotels since the last two decades. Salma Aapa is an avid writer, penning numerous pieces in Urdu. She has authored books like Cooking for an Emperor. This humble and polite food historian is really passionate about her food and how she unearths secret recipes by reading and researching history books, by analyzing how the kings and rulers lived and what they must have liked to eat. 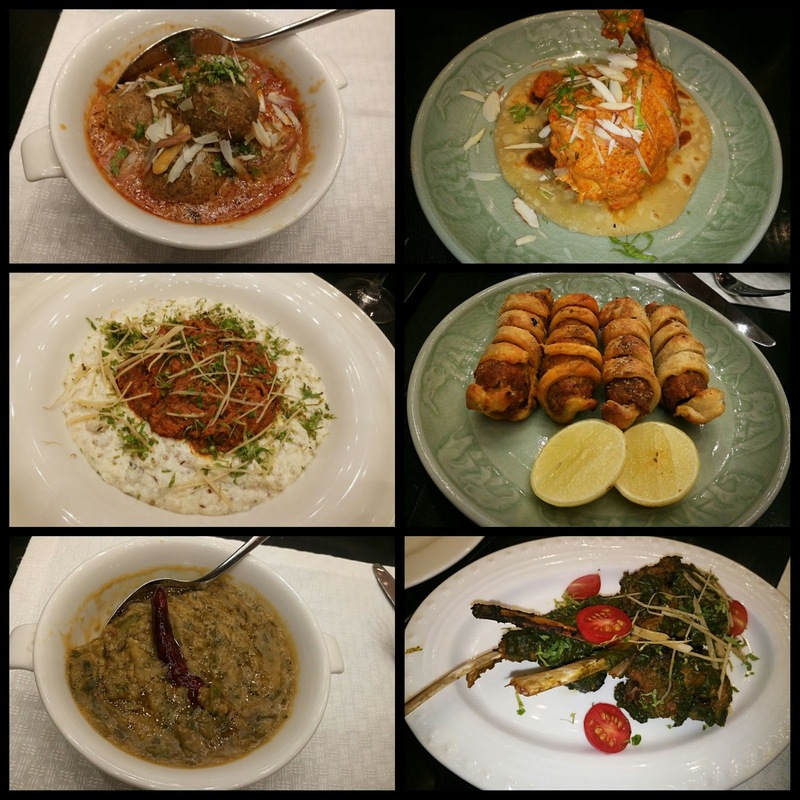 So when the time came for the first anniversary of Delhi Pavillion, the all day dining restaurant at Sheraton, Saket, who else could be the choice but Salma Aapa to curate the menu with their chefs. She is the brains, and Chef Vipul and Chef Mofid her hands, as she says. Literally she is absolutely correct; these Chefs are a real talent and have done wonders to this place. The “Meeras-e-Sultanat” is a harmonious symphony of Turkish, Afghani, Central Asian and Indian cuisines. This unique theme has been derived from the slave dynasty. An ode to the Mohammad of Ghor, the first Muslim ruler of India , Qutubuddin Aibak. Thanks to the most humble and sweet Shreyasi Sanyal (PR & Marcomm., Sheraton, Saket) for inviting us to this unforgettable experience that it was going to be. To begin with, the welcome drink itself was a study of royalty; a fragrant and refreshing gulab ka sharbat (rooh afza) served in gorgeous silver jugs and glasses, redolent of the Mughal Era. A meal that starts out that graciously can only get better. The starters were sumptuous Samboosek (samosas) that too grilled in tandoor (very unlike what we get today), there was the Makai Seekh, the Bulgur Mahi Dolma, and chicken kebab with eggplant. The fish was to die for, melt in the mouth and subtle in flavor. A sparkling wine cocktail accompanied our entire meal, beautifully complimenting the fine flavours of the cuisine. Salma Aapa then graciously led us on to the main course. What an absolutely incredible person she is. She gave us the concept, the history behind every single dish that was made part of the menu. Her childlike curiosity and enthusiasm is a fine example of passion and creativity. Murgh Qutabia(chicken roasted and served in a rich thick gravy) on a pista parantha was so unique and exemplary. The richness of the chicken gravy that came from cream and cashews was indescribable totally. Shahdeg was a mutton dish that was cooked with sumac and pomegranate (a very prominent ingredient used in that era). With a perfect consistency of the curry, the mutton tasted so so hearty. Badenjaan Anari or Baigan as we all know it (eggplant cooked with tomato and pomegranate gravy), Kofte Nilofari was lotus stem made into soft balls and Perizaad (cottage cheese with trio of bell peppers in a turmeric gravy) such a subtle yet flavorful dish. Few dishes were served on the table and weren’t on the buffet- Sultan-E-Delight which was a minced lamb dish with a yoghurt curry. Velvetty in texture, the curry and minced mutton blended so well together, the dish was bursting with flavours! The gravy was magical with great consistency and a dish packed with so much flavour. These dishes were complemented by kaju pista parantha and crisp rotis and naans. The chicken biryani, Khichdi Quroot Afghani, Small balls of minced meat in a biryani that was essentially a khichdi- cooked with rice and moong dal. Desserts were served in shiny silver and golden platters decorated with rose petals with desi sweets in them.Various burfis, laddoo, Jalebi, ; too much sweetness to handle.